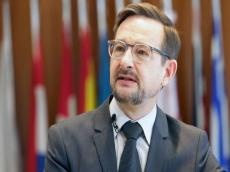 OSCE Secretary General Thomas Greminger is on a visit to Azerbaijan. He's expected to hold meetings with Azerbaijani officials, including those in the Azerbaijani Foreign Ministry. The Secretary General is also expected to visit Alat port. Today, Greminger will also participate in a meeting at ADA University. This is Thomas Greminger's first visit to Azerbaijan after being appointed as the OSCE Secretary General in July 2018. He was elected as a result of so-called procedure of silence - after July 12 the OSCE Permanent Council agreed on a single candidature, nominated Greminger for the vacant post and asked the foreign ministers of the OSCE countries to approve the candidate during a five-day procedure. The appointment came into force, as the foreign ministers did not object to the deadline, which was designated July 18. Previously, Greminger was Switzerland's permanent representative to the OSCE.